We received these products for review purposes. As always all opinions are honest and solely those of mine and JustaBXgirl. I am sure that your littles just like mine are impatiently waiting to see Incredibles 2. 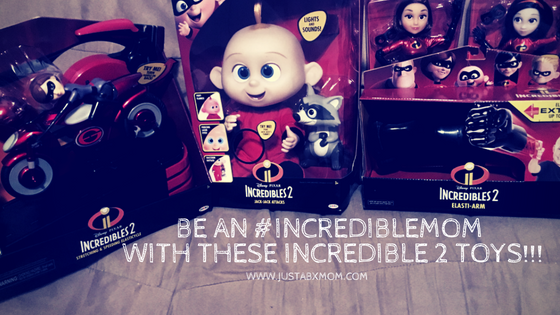 If you’re looking for a way to make the waiting a bit more bearable I suggest you check out these Incredibles 2 products from our friends at Jakks Pacific. Let’s face it, we’re going to buy the toys anyway. Might as well get them in preparation for the movie. I also think getting them before the new movie comes out gives your littles the chance to come up with their own adventures. JustaBXgirl has been having quite the adventure since I allowed her to open the “Incredible” box we received. Here’s a peek at some of what she’s been getting into on her own (with the help of her Incredibles friends). Mom and daughter duo, Elastigirl and Violet seem to always get themselves caught up in sticky situations when JustaBXgirl has to help them come up with ways to escape. Two of my favorite adventures so far have been when the duo was trapped by a giant snake and when Violet got caught hanging around during a training session. When the duo is on a break that doesn’t mean JustaBXgirl is without anything to do. She spends plenty of time helping Elastigirl train on her Elasticycle. I love watching my child’s creativity come out to play. She sets up new obstacles for Elastigirl to bounce off of or avoid. She also plays with the speed that she releases Elastigirl with. This toy can be a great lesson for homeschoolers teaching about velocity! And finally, we have Jack-Jack Attacks. And trust me you don’t want to get Jack-Jack (or JustaBXgirl) angry. His eyes glow blue, his cheeks turn red and he creates sounds to show off his electric sparks. This is one baby you don’t want to mess with. But he is also the sweetest little baby. You can press on his tummy to hear him laugh, babble, cry and make other baby sounds. He also comes with a raccoon which in the movie will be how we find out Jack-Jack has powers. I’m telling you that you will be considered an #incrediblemom if you brought these home for your littles. Which do you think will be your little’s favorite? YAY these are so cool I def like the girl and her bike ElasticGirl Rocks. Girl Power.